Optical experiments on single molecules at room temperature are currently affected by two major limitations: On one hand it is not possible to have arbitrarily long continuous observation periods of one and the same chromophore because of the inevitable occurrence of photoblinking and photobleaching events. For short times, on the other end, the limited number of photons per second which can be emitted by a single molecule require a certain minimum integration time to detect a signal above the omnipresent shot noise. 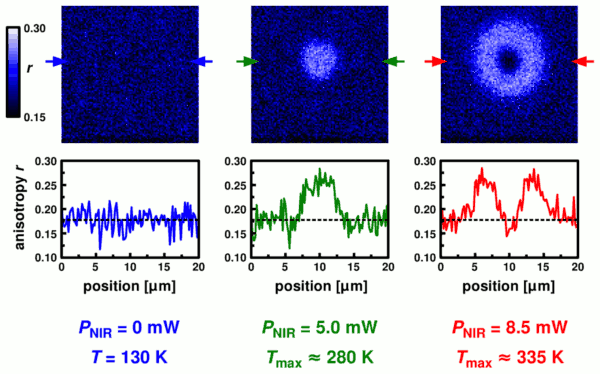 We have developed a novel type of temperature-cycle microscopy to address both these problems. Our method relies on rapid thermal cycling of a microscopic sample to separate the room-temperature conformational evolution of, for example, a single biomolecule from the optical probing of the chromophore(s)/label(s), which takes place under cryogenic conditions. 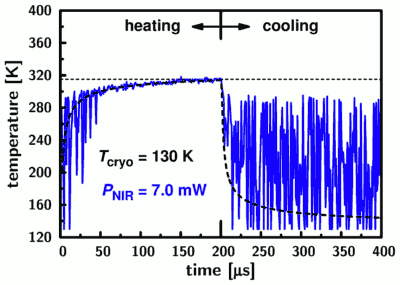 That way we want to probe a frozen “snapshot” of the biomolecule at a temperature where the photophysical parameters of the label(s) are more favorable than at room temperature. In that case the temporal resolution is given by the time it takes to undergo the temperature-jump and is no longer limited by photon statistics. 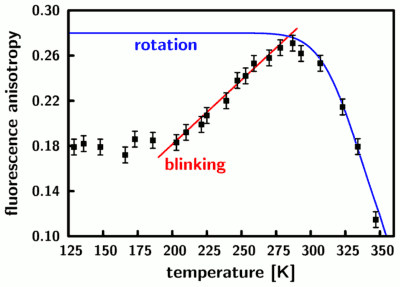 Furthermore, the controlled manipulation of temperature allows one to investigate energetic barriers between conformational sub-states. The core components of our microscope, which are integrated in an optical cryostat, are shown in the diagram above. 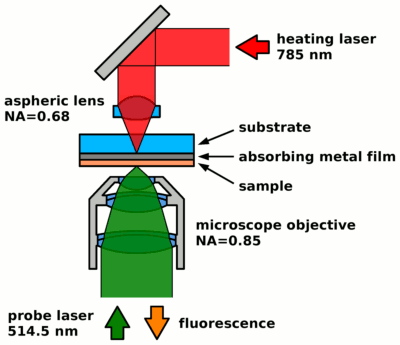 A high-NA microscope objective is used to both focus the optical probing laser and collect the emitted fluorescence, as part of a laser-scanning confocal microscope. The sample film is spin-coated onto an absorbing metal layer which allows us to generate a small hot spot by focusing a near-IR heating beam with an aspheric singlet lens. Additional optics outside of the cryostat make it possible to control the position of the heating spot on the sample. 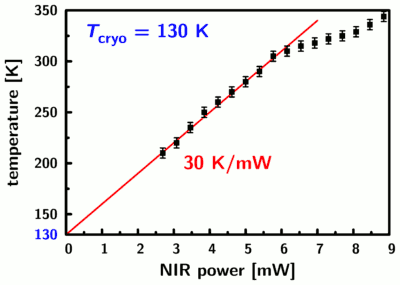 The data (blue line) is noisy for temperatures below 280 Kelvin due to the decreased sensitivity of the anisotropy in that temperature range, but it nevertheless demonstrates directly how fast we reach room temperature when starting from 130 Kelvin. A quantitative analysis using a simple heat diffusion model (thick dashed line) yields a transition half-time of only 3.5 microseconds. This is 2-3 orders of magnitude shorter that the temporal resolution limit due to photon counting statistics which is encountered in conventional single-molecule experiments.